Leukemia is usually thought of as a children’s condition, but it actually affects more adults. It’s more common in men than women, and more in whites than African-Americans. There’s really nothing you can do to prevent leukemia. It’s cancer of your blood cells caused by a rise in the number of white blood cells in your body. They crowd out the red blood cells and platelets your body needs to be healthy. All those extra white blood cells don’t work right, and that causes problems. Blood has three types of cells: white blood cells that fight infection, red blood cells that carry oxygen, and platelets that help blood to clot. 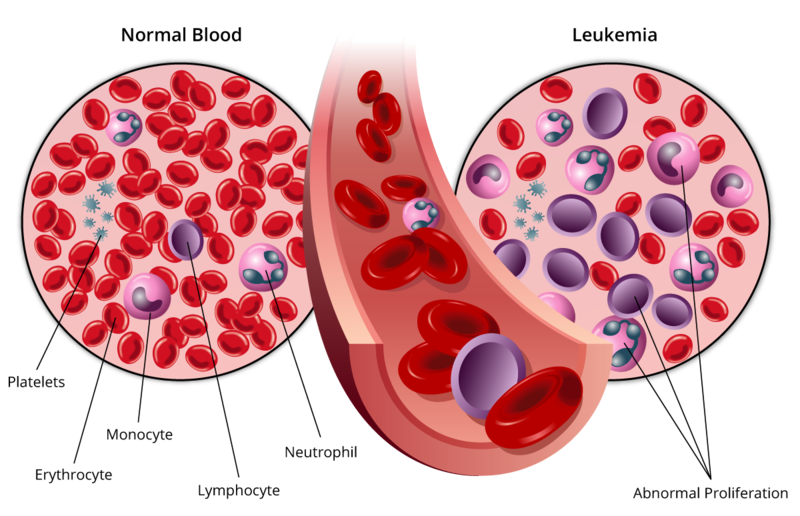 Every day, billions of new blood cells are made in the bone marrow -- most of them red cells. But when you have leukemia, your body makes more white cells than it needs. There are two main types of white blood cells in your body: lymphoid cells and myeloid cells. Leukemia can happen in either type.These leukemia cells can’t fight infection the way normal white blood cells do. And because there are so many of them, they start to affect the way your major organs work. Eventually, there aren’t enough red blood cells to supply oxygen, enough platelets to clot the blood, or enough normal white blood cells to fight infection. Along with infection, this can cause problems like anemia, bruising, and bleeding. These types are then put into one of two categories: acute or chronic. Acute leukemia happens when most of the abnormal blood cells stay immature and can’t carry out normal functions. It can get bad very fast. Chronic leukemia happens when there are some immature cells, but others are normal and can function normally. That means it gets bad, but more slowly. Radiation uses high-energy X-rays to kill leukemia cells or keep them from growing. You can get it in only one part of your body where there are a lot of cancer cells, or all over. Biologic therapy, also called immunotherapy, helps your immune system find and attack cancer cells. Drugs like interleukins and interferon can help boost your body's natural defenses against leukemia. Targeted therapy uses drugs to block specific genes or proteins that cancer cells need to grow. This treatment can stop the signals leukemia cells use to grow and divide, cut off their blood supply, or kill them directly. Stem cell transplant replaces the leukemia cells in your bone marrow with new ones that make blood. Your doctor can get the new stem cells from your own body or from a donor. First you'll have high doses of chemotherapy to destroy thecancer cells in your bone marrow. Then you'll get the new stem cells through an infusion into one of your veins. They will grow into new, healthy blood cells. Surgery. Your doctor can remove your spleen if it is filled with cancer cells and is pressing on nearby organs. This procedure is called splenectomy.